The secret’s in the pudding! I love recipes with secret ingredients! This one calls for butterscotch instant pudding mix in the batter and receives rave reviews for being “outrageously delicious and moist.” I use rum extract instead of vanilla, nutmeg in lieu of cloves, more canned pumpkin and then top it all off with my very own lemon cream cheese frosting which contains a secret ingredient of its own: lemon emulsion. 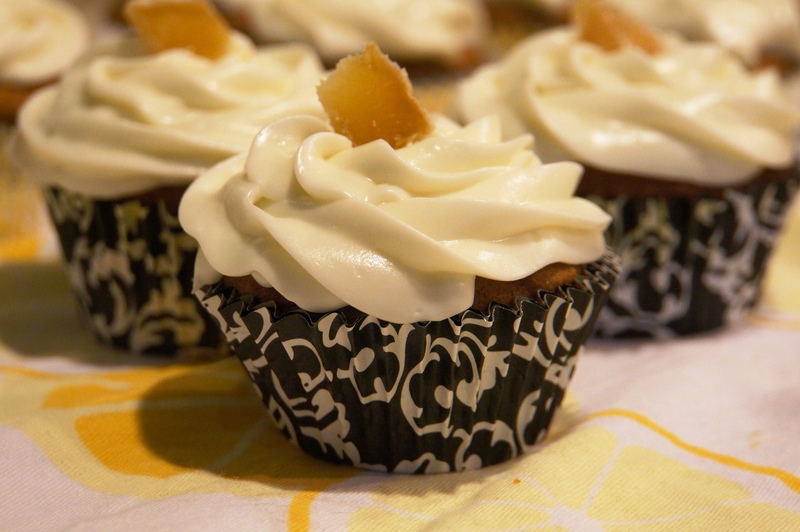 Add a slice of crystallized ginger to the icing on the cake and your taste buds will zing! Great for cupcakes, loaves or both. This recipe is sure to become a fall classic. Just beware: this is one secret you won’t be able to keep! Butterscotch pudding mix, pumpkin purée, spices, and rum extract make a perfectly moist cake that tastes of fall. Crystallized ginger and Loverbean’s Lemon Cream Cheese Frosting “take the cake” to the next level. Fill muffin tins fairly full. Makes 24 or more cupcakes or 18 cupcakes and one large pumpkin loaf. 1. Preheat an oven to 350 degrees F (175 degrees C). Grease 24 muffin cups or line with paper muffin liners. 2. Whisk together the flour, pudding mix, baking soda, salt, cinnamon, ground ginger, allspice, and nutmeg in a bowl; set aside. 2. 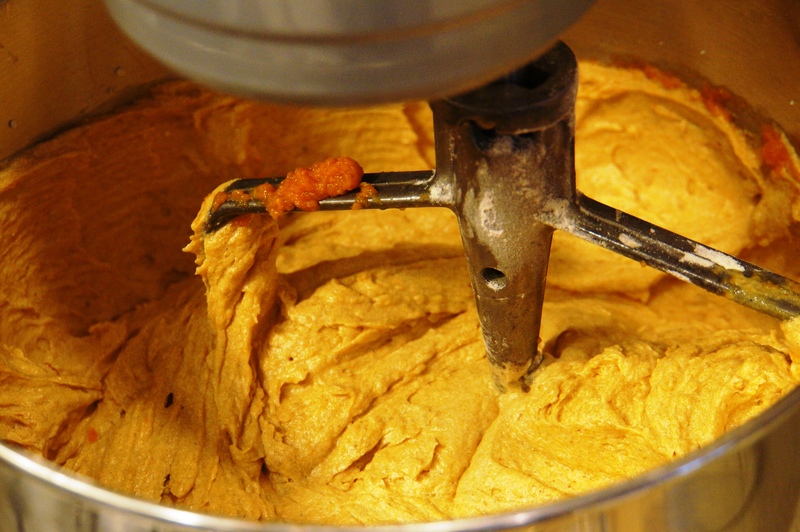 Beat butter, white sugar, and brown sugar with an electric mixer in a large bowl until light and fluffy. The mixture should be noticeably lighter in color. 3. Add the room-temperature eggs one at a time, allowing each egg to blend into the butter mixture before adding the next. Beat in rum extract and pumpkin purée with the last egg. Stir in the flour mixture on low until just incorporated. 4. 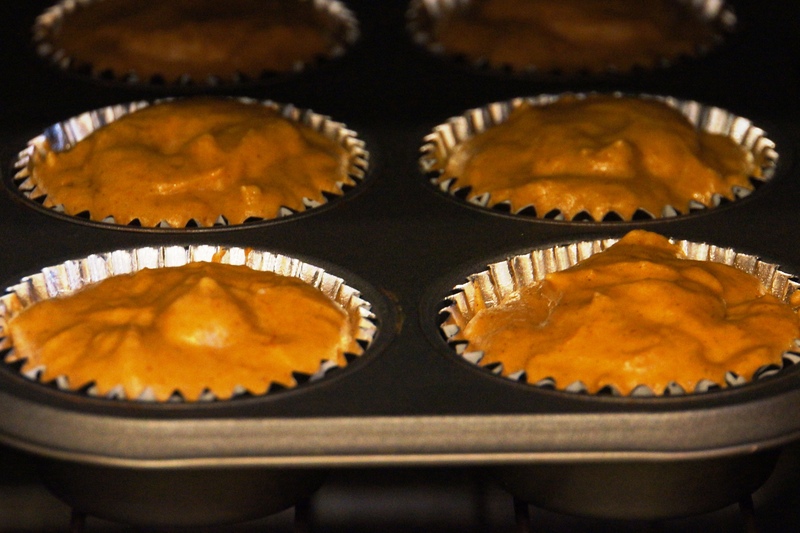 With a large spoon, scoop the batter into the prepared muffin tins until nearly full. There will likely be a little batter left over. If reserving some batter for a loaf, line a large loaf pan with parchment paper before adding batter. 5. Bake in the preheated oven until golden and the tops spring back when lightly pressed, about 20 minutes for cupcakes and 40 minutes for a loaf. Cool in the pans for 10 minutes before removing to a wire rack. Cool completely before topping with Lemon Cream Cheese Frosting, recipe below. Makes 24+ cupcakes or 18 cupcakes and one large loaf. While lemon juice provides moisture and a hint of lemon, it is Lemon Emulsion that gives this cream cheese frosting its full lemon flavor. Emulsions are favored over extracts by professional bakers as they have a more potent, robust flavor that won’t bake out as they are alcohol free. Available online at LorAnn Oils and at bakery supply stores such as Kitchen Collection. 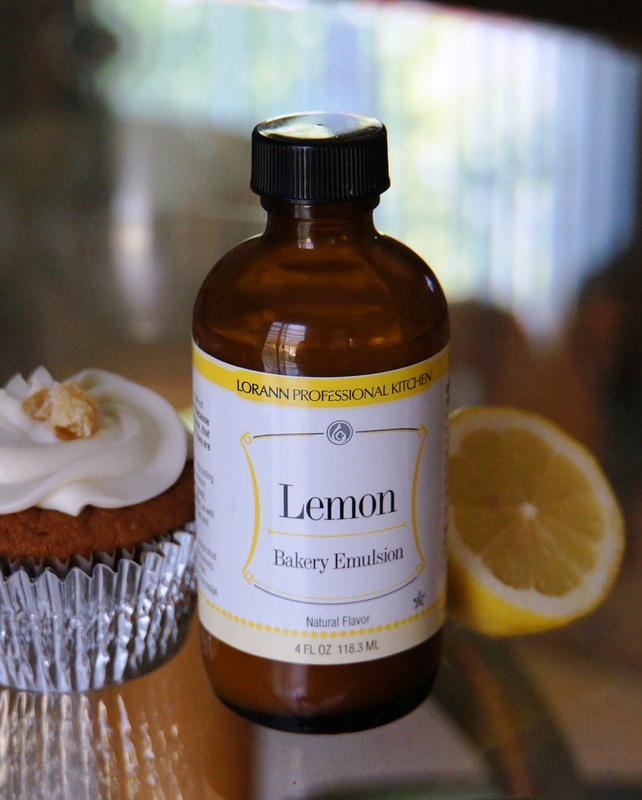 Emulsions are a necessity for any baker who wishes to infuse intense flavor into goodies and Lemon Emulsion is a must for lemon lovers. 1. Place butter and cream cheese in a mixing bowl and beat on medium high for two minutes. 2. Add 2 c. powdered sugar a cup at a time, mixing well. 3. Mix in lemon juice and lemon emulsion and then add remaining 2 c. powdered sugar a cup at a time, mixing well between each cup. 4. Use a wide tip to pipe frosting on cupcakes from outer edge to center in a swirl. 5. Garnish with a slice of crystallized ginger. A perfectly moist pumpkin cake is topped off with lemony cream cheese frosting and a sliver of crystallized ginger. This recipe is adapted from allrecipes Pumpkin Ginger Cupcakes which calls for 1/3 c. finely chopped crystallized ginger in the batter. As I had the palates of old and young alike in mind, I chose to use the ginger as a garnish. Not everyone appreciates the sweet heat of ginger. In addition, some of the reviews I read also noted that the crystallized ginger may have made the cake a bit gummy. Next time round, I will insert a small piece of crystallized ginger in the center of a few cupcakes before baking. Yum! Thank you Danielle. I’ve missed you! These Pumpkin Cupcakes are just the best. I hope your readers invest in a little Lemon Emulsion for the frosting and other recipes. While cream cheese frosting in and of itself is mighty fine, the lemony flavor the emulsion imparts is just divine! That looks amazing!!! I am making this recipe!